family traditions to life. This book was just published about a month ago. 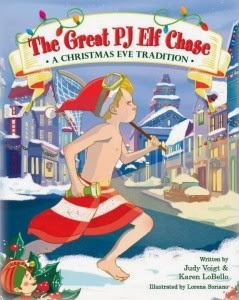 “The Great PJ Elf Chase” will have children, ages 3 to 10, laughing out loud and looking in nooks and crannies for Santa’s Elves. This is an absolutely adorable book about two precocious little boys who decide to try to catch one of Santa's Elves when they stop at their home to bring their gift of new pajamas. These sneaky Elves usually visit each year while the boys are bathing to drop off new PJ's right outside the bathroom door - this year, they have a plan to catch one of those tricky Elves in action. But as with all good plans made my mischievous little boys - something goes a bit haywire. In my home we do give new pajamas for Christmas most years but they are in with all the other gifts under the tree and do not have a special day or significance. As I have read about other family's traditions, I am thinking that ones like this one could be fun to start next year with my own kiddos! I know they will enjoy the fun - they may even decide to try to catch their own Elf! 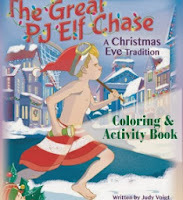 So, check out the Great PJ Elf Chase and maybe you also will choose to pick up one of these books to read to your kids - so they can make their own Elf-Catching Plans! You can read more about the book on the website, www.TheGreatPJElfChase.com. And check out the fun Coloring and Activity book that goes with the story!